Nestled in the midst of the tall office buildings that comprise this complex, a clutch of restaurants aim to satisfy the Punjabi demographic of these parts. Dim incandescent bulbs, the smell of chicken roasting on skewers, a light shroud of early winter fog, and in the middle of it all, strapping young lads animatedly discussing their meal — this might just be the farm-bred Punjabi’s urban idyll. Our restaurant of choice for the evening was Khyber, an establishment that had earned its reputation with decades of service at its previous Kashmere Gate location. Like the other restaurants in this oversized food court, it has an open kitchen, with outside seating. Unlike some of the others, however, Khyber also allows you to bring your own drinks. Which was just as well, because a spot of rum in our coke (courtesy Navy man Arnab) was just what we needed to get the blood running in our veins. No sooner had we settled down that the first dish arrived. 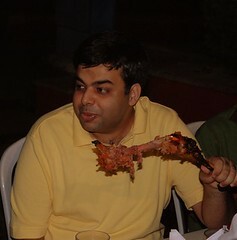 Banno kababs are morsels of boneless chicken, marinated in ginger and garlic, then dipped in spiced curd, and skewered. As a final, defining touch, the skewers are coated with an egg mixture and roasted again. The result are incredibly succulent kababs that we all wolfed down in minutes, and promptly ordered for another round. Another specialty of Khyber is the Secundari Raan (whole mutton leg), which needs to be ordered in advance. It is served rather attractively in a glass platter, surrounded by fresh salad, and cooked to a rich saffron hue. Our raan felt a little underdone though, perhaps a consequence of an anxiety to quickly feed such a large group with voracious and vocal appetites. 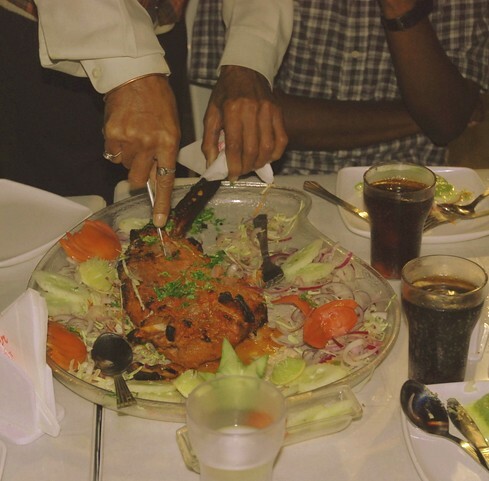 Despite that, we agreed that the spices in the raan were just right, and we would certainly come back for more. I didn’t sample the fish tikka we had ordered, but Harneet assures me it was even better than the one we’d had at Al Zahid a few months ago, which is no small compliment. But we’d also been recommended another restaurant in the same complex, so as soon as we’d polished off our order at Khyber, we repaired to Punnu Biryani a few score yards away. We decided to start with some “fish orley”, which were lightly fried boneless fish sticks. The fish itself was just middling, but it was accompanied by a white sauce as well as, rather unusually, a hot chilli sauce that mixed well with each other to uplift the fish. We also ordered the mutton, chicken and egg biryanis, all of which I found rather unremarkable. The mutton seemed rubbery, though we were told that that is the price to pay for removing the bones from the meat prior to cooking. That was the last of our food at the J-Block Community Centre. We didn’t have the appetite to try out some of the other attractions of the area, including Sethi’s, which seemed to be extremely popular with the local crowd. For vegetarians, we noticed at least two restaurants, Bal Gopal and Sitaram Chhole Bhature. 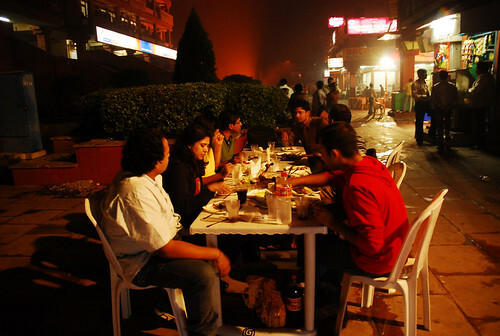 The second may possibly be a branch of the famous joint in Paharganj, but closes relatively early in the evening. We weren’t yet done for the day, though. How could we? 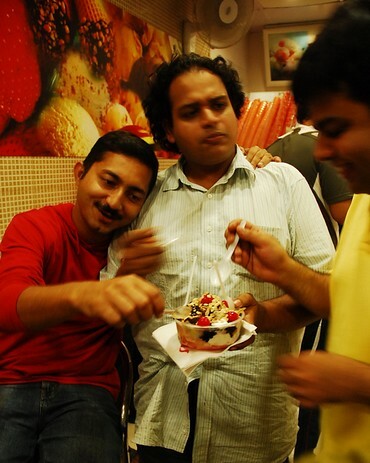 Half the reason for coming all this way had been Giani’s Icecreams, and so we headed to the parlour we’d seen next to the Rajouri Garden Metro Station. I recall they were all good, but otherwise my memory of the hot-chocolate fudge, the Sharifa, the cassatta, the mocha almond fudge, and the Kucch Nahi sundae (an extravagantly unusual concoction which tasted of paan) are somewhat fuzzy. You see, our attention was diverted by the TV set and the small business of India winning an ODI series at home against Pakistan for the first time in 24 years! A perfect end to an evening of good food and great company! Location: From the Rajouri Garden Metro station, take a rickshaw to “Otik Plaza”, which seems to be a landmark located in the same J-Block Community Centre. It’s a ten minute ride away. Map Location. Prices: Expect to spend about Rs. 250 per head for a big appetite, without ice-creams and drinks. Disclosure: The owner of Khyber restaurant is a friend of Shashank Khandelwal’s. This is why we ended up going to Khyber rather than one of several other restaurants in the same complex. Good hae jee. Somehow, the photographs look better, here. I have been to this market several times, however always eat at Sethi’s. Hmm..Banno kebab eh? Most probably a reference to Bannu in NWFP in Pakistan. Lots of Bannuwali immigrants in Delhi. The Bannu language is an offshoot of Pashto. So highly possible that the food is influenced by Pakhtoon/Afghan food. @Thalassa: Fascinating insight. Yes, I’m aware of the Bannu in NWFP, but never made the connection. I think next time I go to Khyber, I’ll ask. LOVE the caption for the last photograph, btw. This place also has the “Paramjeet Machi wala”. The fish tandoori and tandoori chicken are a must and are perfectly done. I have been eatingout there for the last 3 years and have never got any reason to complain. We normally order the dal makhani and butter nans from Bal Gopal and the fish,tandoori chicken from Paramjeet. as for getting your own drinks, let me warn anyone who would take the liberty of drinking out there. Now a days there is a lot of police guys in plain clothes loitering around the area waiting to pounce on anyone who dares drinking out there, not to mention there is a Police Station right opposite..So the best is that you finish you drink on your way to the place and just enjoy the great food. On the contrary, I had a very bad experience once when I went to Giani’s in Rajouri Garden. The person at the counter did not listen to me, and when he did he was so straight and rude that I did not feel like ordering, but I still went ahead. I dint know worse things were in store. THe guy across the ice cream counter did not hear even after I called him ten times. Over that the AC was not working. The customer treatment was so disappointing that I came back embarrassed. Shld have chosen Otik instead. Its normally not like that.. It could be you!!! Next time anybody is in West Delhi, go to Kirti Nagar next to Fun Cinemas(erstwhile Natraj cinemas) and try out “Paramjit Machi Walla” and try tandoori machhi (Pomfret in winters) and tandoori chicken all made in desi ghee. the best you will ever have. Its run by father and two brothers. Am being told by other guys that he has atleast rs 10 Crore white in his bank accounts. Kyber and Punnu are closed now. I tried Sethi’s for banno kabab, stuffed chicken tangri and mutton seekh. It tuned out to be ordinary. Nothing very special.